Suspect Named In Van Attack On Worshippers Leaving London Mosque : The Two-Way British media say 47-year-old Darren Osborne of Cardiff, Wales, is in custody on alleged terrorism offenses. 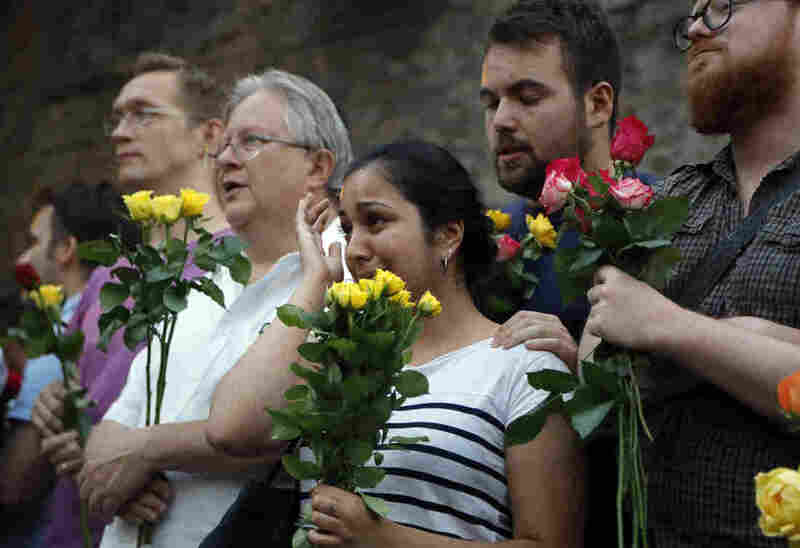 People take part in a vigil at Finsbury Park in north London, where a vehicle struck pedestrians on Monday near a mosque. British media say 47-year-old Darren Osborne is the man who allegedly drove a van into a crowd of people leaving a north London mosque very early Monday. Police have not yet confirmed the suspect's identity. The BBC reports that Osborne "was held on suspicion of attempted murder and later further arrested over alleged terror offences." "Deputy Assistant Commissioner Neil Basu said, "The attack unfolded whilst a man was receiving first aid from the public at the scene." Police say it is not yet clear whether the man's death was a result of the attack." NPR's Frank Langfitt spoke in London to local artist Ferhat Laichour, who says he arrived 10 minutes after the attack and heard the van's driver saying, "Let me kill, let me kill." The BBC says Osborne, a father of four, is reportedly from the Cardiff, Wales, area. Osborne's family released a statement saying, "We are massively in shock, it's unbelievable, it still hasn't really sunk in. We are devastated for the families, our hearts go out to those who've been injured." The attack comes amid fears of retaliation against Muslims following three recent, deadly attacks in the United Kingdom, at Westminster Bridge, Manchester Arena and London Bridge. The Islamic State has claimed responsibility for the attacks. Frank reports that Muna Mohamed said one of her relatives suffered a broken back in Monday's attack and is in critical condition. "No, I'm not going to go to the mosque anymore. I feel scared," Mohamed said. In remarks outside Downing Street on Monday, Prime Minister Theresa May said, "It is a reminder that terrorism, extremism and hatred take many forms; and our determination to tackle them must be the same whoever is responsible." May vowed to provide extra police resources to protect mosques. White House press secretary Sean Spicer said the Trump administration has made clear that the United States is ready to offer any assistance the United Kingdom might need.